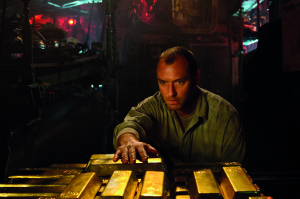 Jude Law as submarine Captain Robinson © Universal, Alex Bailey, Focus Features. Black Sea is an adventure thriller about a rogue submarine captain who brings together a misfit crew to seek out a sunken treasure rumoured to be lost in the depths of the Black Sea. The film was written by Dennis Kelly (Utopia, Pulling), directed by Kevin Macdonald (The Last King of Scotland, Touching the Void) and stars a number of acting talents including Jude Law (Sherlock Holmes, Cold Mountain), Scoot McNairy (Argo, 12 Years a Slave), Ben Mendelsohn (The Dark Knight Rises, Killing Them Softly), Jodie Whittaker (Broadchurch, One Day) and Michael Smiley (The World’s End, The Other Boleyn Girl). The Black Sea production team visited the Black Widow Submarine, which is moored in Strood on the River Medway in August 2013 to film submarine interiors. The Black Widow is an ex Russian Foxtrot Submarine which was built in 1967 and was in active service until 1994. The submarine was also used in 2013 for the shooting of The Fitzroy, a black comedy about a leaky submarine hotel. Strood is in the Medway towns and productions that have previously filmed in the area include Mr Turner (2014), The Mystery of Edwin Drood (2012) and The Golden Compass (2007). Black Sea is released in cinemas on Friday 5th December 2014. This entry was posted in Filmed in Kent and tagged Ben Mendelsohn, Black Sea film locations, Black Widow Submarine River Medway, feature film, Jodie Whittaker, Jude Law, Michael Smiley, Scoot McNairy. Bookmark the permalink.